With the school run everyday and the nights drawn in it seems that when my eldest gets back from school all I do is cook them tea and put them to bed. It feels a bit of a treadmill. So On Friday night I went through the rigmarole of putting all their suits on, and made them go out into the dark and cold. Each with a torch. Normally I dart out and leave the kids inside as I go to get firewood. But I thought that tonight we'd do it as a team. There was a bit of moaning form the younger two! Also I want them to be comfortable in the dark, I never feared the dark and I hope they don't either. 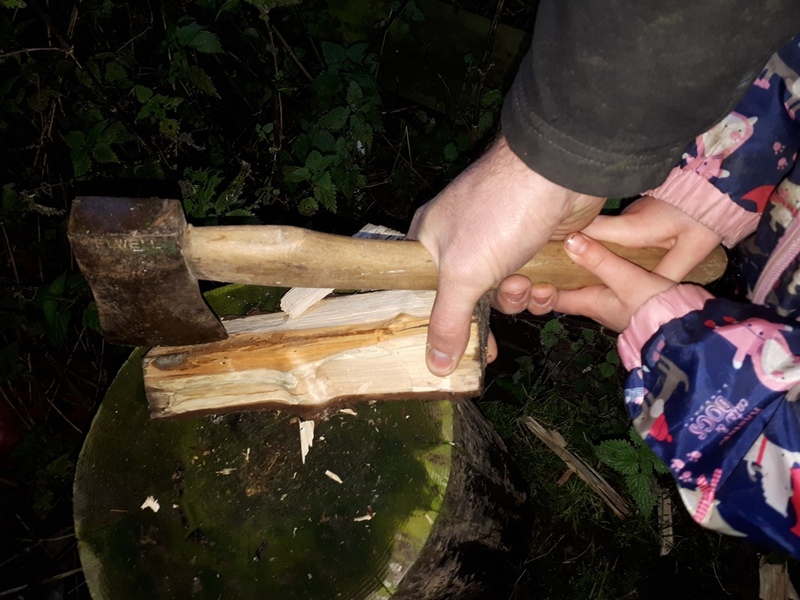 I got my eldest to split the kindling with me. I held the axe with her and the did the safe and controlled chopping where the firewood moves with the axe. She loved it! First thing she told her mum when she got home! All proud as I lit the fire! Hopefully we'll do more things like this. Ideally I could do with a list of tasks that a young one could do with me and take around 30 minutes. Something that could be fitted in after school and would help them learn skills, I'm thinking mainly bushcraft and homesteading type things. We could do something a couple of times a week, maybe making a shelter or creating a camp in the garden. When growing up in our family, we all had different task to do each day, and when playing we all loved torch tag. Yes! We used to call it torchy! Mine are probably a bit young yet but I'll play that with them that's for sure. I'll then move them on to bb guns...! We used to have to check the chickens had gone in and shut the slot, I used to do that on my own. My grandfather used to make us all wall the fences, this was more after christmas when it starts to get lighter. Checking for broken parts or damage to fence posts. Cows like to itch themselves and its not till winter time he had time to do it. I dont know if this was just to get us out of the way but he also used to get us to whack the grain store and the hay with sticks and take the dogs with us, to make rats and mice leave home. lol I am not suggesting you do this. My parents have the great grandkids set the table, clear their own plates and when everyone has left the table they have to wipe the table, put the place mats back and they use the dust buster on the chairs and under the table. They fight over this as it earns them pocket money. Tiny children LOVE to contribute (unlike older children. Just make a fuss of them for their efforts and watch them glow. Here are a few suggestions. Collecting kindling (pine cones or chips of wood round the base of the chopping block or likely sticks when out and about. teach them the names of tools (eg secateur, hand fork) have a spot for them where they are always stored and then get the kids to a) put them away and b) fetch them for you to save your legs. Have kid sized weed pots so as you weed and fill them, the kids can carry the weeds away and dump them near a compost bin. Have stools inside so that the kids can reach the sink (tiny quite kids can ever do some washing up and love doing so), or help peel veg or get table settings from a drawer or set the table or just wash their own hands properly before dinner. It's not about using the kids as workers, but getting them into a routine of being useful members of the family so they learn that work has to be done but doens't have to be something that is moaned about and everyone contributes. After the October half term I used to collect mine on foot from primary school at 3.15. A quick stop at home to go to the loo, change into warm clothes and Wellington boots and then up the hill for a walk and a play in the woods. We would look at the moon, work out the stars, try and spot planets (the Guardian newspaper has a monthly star watch column), listen for animal sounds and generally retune after a manic day of school. I took tea in a flask and something to eat. I kept after school clubs to a minimum. Brownies in the church hall to which we walked there and back through the batty churchyard and football training always outside in the dark on real grass under Heath Robinson lights. Nowadays apparently football training either indoors or outside on cancer-inducing AstroTurf because the parents don't like the muddy kit! My son is now 24 and back living at home with us after university and most evenings he goes for a run in the dark. He knows the local landscape well but says his eyes soon attune to the darkness. Yes, please get your children used to being outside without artificial light. They will soon grow to love it. A brilliant plan, knowing what goes into the day to day running of the home is vital and they will get a real sense of achievement by being allowed to help ... even if it does take you twice as long. You could also get them used to helping with the tea preparations. Wiping the table, laying out knives and forks etc, and helping clear it after they've eaten.